Style Name: Mini Eared Ramekin, 1 Oz. Mini Eared Ramekin, 1 Oz. Brand HIC Harold Import Co.
HIC’s Mini Eared Ramekins, specially designed for use in the oven and under the broiler, are ideal for creating mini appetizers, small bites, desserts and other single-serving recipes. This versatile serveware is perfectly sized for use as individual butter crocks and salt cellars. And, they work equally well for portioning single servings of condiments, dipping sauces, spreads, grated cheeses, garnishes, olives, and jams, at each place setting. Even use them as prep bowls for easier food preparation. Classically styled to complement any table setting, HIC’s Mini Eared Ramekins perform beautifully at every dining occasion, from breakfast to lunch or brunch, for holiday meals, party buffets, even outdoor entertaining. A tradition since 1957, HIC Fine Porcelain Bakeware and Serveware is safe for use in the microwave, oven, broiler (to 500-degrees Fahrenheit), and freezer. 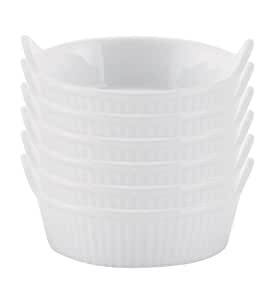 These ramekins are dishwasher safe for easy cleanup. Set includes 6 (2.75-inch) Mini Eared Ramekins. 5.0 out of 5 starsBad Reviewers. People!! Bad Reviewers......Are you nuts?? Get out the tape measure to understand the size and shape if you need to before purchasing - your size mistake is totally your problem. First - these are Ramekin's used in Mise en Place for cooking. Chefs would love and use them. Think Herbs and Spices for your Mise on Place in these little babies. Second - cute little buggers that can hold little small accompaniments to a meal...what's not to love? Just got these in the mail and they are perfect! They are the perfect size for an individual dessert. I bought them to make creme Brule and they appear to be just the right size. I was happily surprised that they are all marked with a sticker saying that they are oven broiler microwave and dishwasher safe! The sticker also says that they are 6 oz not the 4 like I had read. 5.0 out of 5 starsFits my purposes. I know these are meant for food. But when I got and order of watercolor paint and seeing the caps popped open, I had no choice but to put the entire tube of watercolor paint into these little crocks of mine to dry so they would not be wasted. Oh My goodness what a great idea that was. I am a watercolor artist and these are perfect for a watercolor palette. The paints dried beautifully inside like good sized pan paints. They are stack able too so I save space.